“Making It Happen: A Memoir of Peace Corps and Venezuela in the 1970s” narrates the author’s life-changing experiences after deciding to get a fresh start, pack it all up, join the Peace Corps, and leave the life he’s known behind. Sometimes, finding one’s place and purpose in this world happens from life-changing experiences far from one’s comfort zone. After graduating college, Mike Kendellen thought about his life and finding his place and purpose in this world. He wondered, what should he do next? Travel? Get a job? Start a career? Get a fresh start? Pondering about what his next move should be and what his future holds eventually led him to a journey he will never forget. 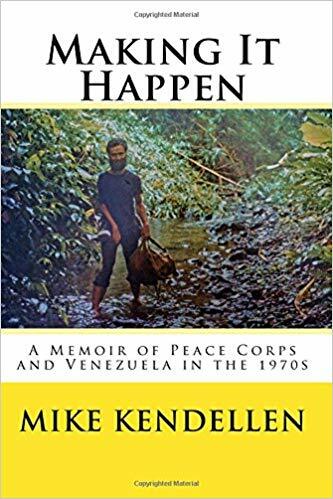 “Making It Happen: A Memoir of Peace Corps and Venezuela in the 1970s” paints the picture of Kendellen’s life moving to Venezuela and being a Peace Corps volunteer. He shares reflective and evocative tales during an era where everything was different. He shares his experiences from coaching baseball to working with children with special needs. Other than that, he provides readers an eye-opening and honest view of the world during this era as well as the people he met along the way and the challenges he faced. Indeed, “Making It Happen” will remind readers that sometimes, finding one’s place and purpose in this world happens from life-changing experiences far from one’s comfort zone. Relive Mike Kendellen’s touching memoir about seeking one’s true place in this world in “Making It Happen.” In the hopes of reaching out to a wider audience, Kendellen’s memoir will take part in the upcoming 2018 Frankfurt International Book Fair. Happening on October 10-14, 2018, this book and thousands of other titles will be of attendance during this wonderous affair so be sure to check it out! Mike Kendellen was a Peace Corps Volunteer in Venezuela and Morocco in the 1970s. After Peace Corps and until he retired in 2014, he directed programs in various refugee and post-war settings in Asia, the former Soviet Union, and the former Yugoslavia. From 1999, Mike supervised, monitored, researched and surveyed projects on three continents associated with the Anti-Personnel Mine Ban Convention, landmine survivors and surveys. He and his wife, Barb, live in Washington, D.C.